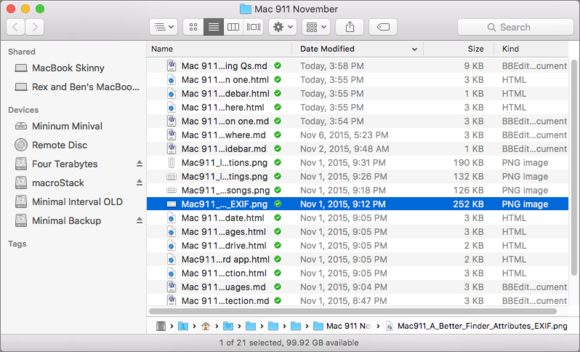 Are you having heartbreak of missing favorites in El Capitan? A restart will help. Did you suddenly notice that the items you added to the Finder sidebar are suddenly missing either in the Finder or Open/Save dialogs or both? It’s not you: It’s a bug. It’s a subtle thing, because nothing fails; rather, it dawns on you that when you’re clicking to navigate to a folder via your sidebar’s Favorites list, there’s nothing there. This happened to me recently, and I discovered it’s a routine problem people are experiencing. While several solutions have been proposed, including deleting cache files and the like, what appears to work best—and worked for me—is to restart your Mac. When I had my sidebar faves disappear, I also had some other seemingly inexplicable slowdowns and system oddities. These went away with the restart as well. This is the sort of thing that Apple will fix in a dot release (perhaps 10.11.2? ), but, for the meantime, restart in an orderly fashion when you see it happen. The Favorites menu can disappear in El Capitan.